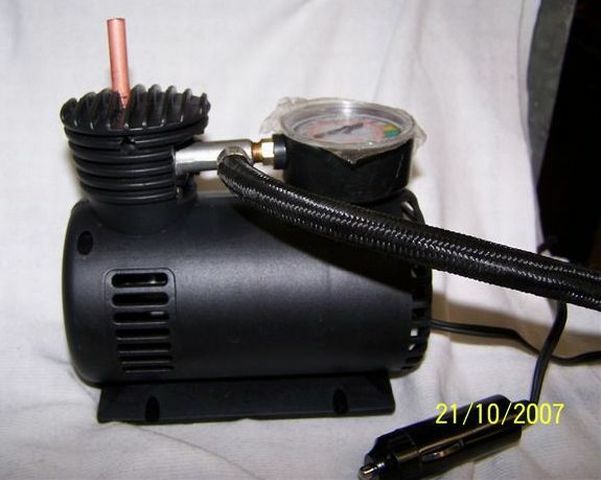 It is fairly well known that the cheap Chinese car air compressors can be converted into effective vacuum pumps. This article describes how to do it. The type of pumps we are using usually cost about $20 and are readily available in Supercheap Auto, Kmart and similar shops. They are often on special and you may be able to get them at extremely cheap prices. 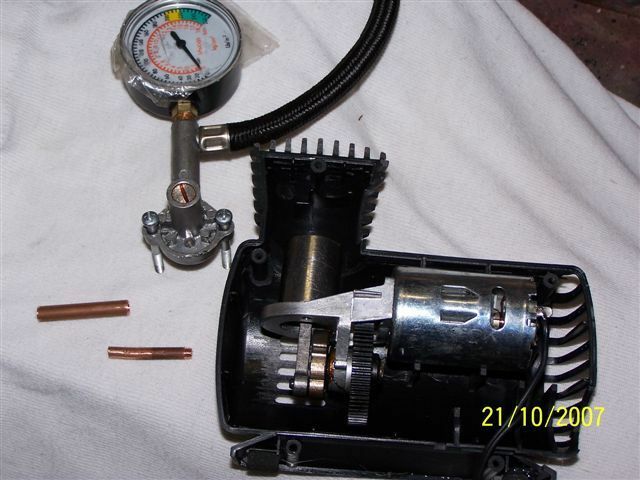 The ones I have obtained usually are fitted with a pressure gauge. This of course is of no use for making a vacuum, but the alteration process does not effect the air compressor ability of these little units, so it simply becomes a multi function device! Take the unit apart by undoing the 5 screws in the side of the plastic case. The internals have a steel cylinder that is sandwiched between the crankcase and the head by two long screws. They easily come out with a Phillips head screwdriver. On the head the suction hole is adjacent to the pressure outlet. On the piston side it is covered by a spring steel flap valve. Mount this in your vertical drill vice, and using a No.17 drill, enlarge the air entry hole but be careful not to go right through. About 3mm is the maximum depth, maybe a little less. Don�t let the drill touch the flap-valve. Tap the hole 3/16" x 40 tpi, only to the depth of the larger hole. Use the plug tap straight off � the alloy is very soft. Thoroughly clean off all the swarf, including any that got under the flap. Blowing it out is usually the best approach. As my vacuum connections are all made with 1/4" pipe, I needed to join some 1/4" tube onto 3/16" tube. Cut a piece of 3/16" copper tube 30mm long. Thread one end 3/16" x 40 tpi for about 2-3mm. Cut a piece of 1/4" inch copper tube 40mm long. Put in the lathe and drill out one end to 3/16" diameter for about 3/16" depth. Insert the plain end of the 3/16" pipe into it and silver solder. 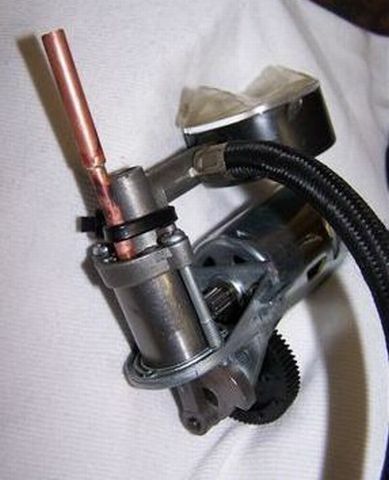 After cleaning up, screw it into the tapped hole in the head with a smear of Loctite on the threads. Fit a cable tie around the pipe and head as shown in the photo to hold things together. Ensure all is clean. Test the pipe by sucking and blowing. You should be able to blow through OK, but sucking should encounter resistance. Reassemble the head to the cylinder and crankcase. Take the plastic case and just in front of the centre of the cylinder using a round file, file a half round space in the top. Similarly on the other side. Check the pump for fit. You may have to trim some other internal plastic sprues to clear your new vacuum inlet. Reassemble the unit inside the case, and the job is done. If you have a vacuum gauge it can now be tested. 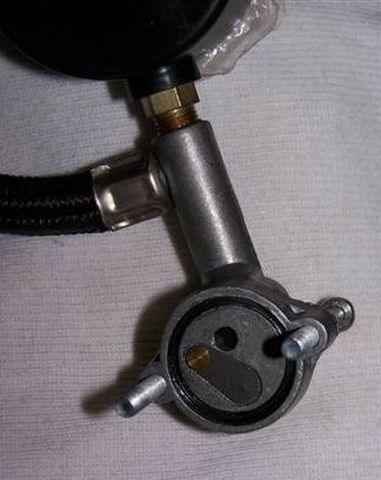 Connect the gauge onto the copper pipe using a suitable (6mm) rubber hose. 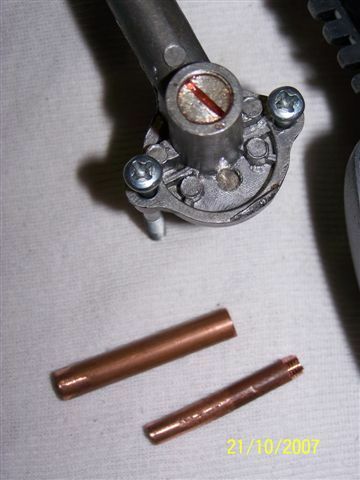 Apply 12V (you can use your car cigarette lighter if you haven�t cut the plug off yet) and see what it pulls. If all is well it should be capable of exceeding 20 inches Hg [~68kPa, or ~10psi]. If it is less, then you have probably damaged the flap valve. However even so, if it pulls more than (say) 12 inches Hg it will still be an effective pump for your brakes. If you did damage the flap valve to an unacceptable extent, it will need to be replaced. Use a piece of spring steel. An old 5 or 10 thou feeler gauge is OK. Centre pop and then drill out the rivet holding the old flap valve to the head with a 3/32" drill. Also drill a hole in your old feeler gauge, and then cut a new flap valve from it. It may be easier to shape it on your grinder. Now the problem is likely to be the seat. Perhaps you drilled right through! It will need to be cleaned up and made flat. As the flap valve is recessed you will need to use a small diameter (3/16") slot drill. Set this up in the mill or lathe (with the head suitably packed under the toolpost) and take a teeny cut off the face in the recess until it is obvious the whole thing is flat. Make sure the cut extends to the securing rivet area as well. When satisfied reassemble your new flap valve with a new 3/32" rivet pushed into the hole with some Loctite. It�s a good idea to machine the head flat and thin before it is inserted to ensure it clears piston at the upper part of its travel. How do I know all this?? Don�t ask please! Author: Warwick Allison. This article first appeared in the Sydney Live Steam Locomotive Society Newsletter May 2008 and is used with permission. 104 Text and photos Copyright © 2006-2019 SMEX, All rights reserved.